Oat and wheat bran are both beneficial. 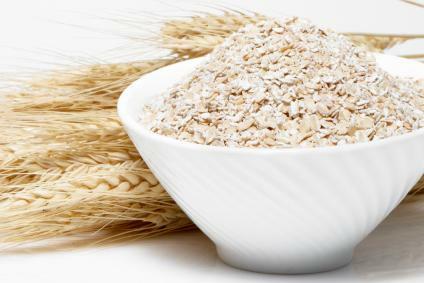 When you compare oat brand vs wheat bran, each has its benefits for health and wellness. Both can become part of a well balanced vegetarian or vegan diet. Walk down the cereal aisle at the grocery store and you'll notice immediately all of the health claims attributed to oat and wheat bran. There are slightly different health benefits from eating each one. In various human trials, oat bran eaten as oatmeal for breakfast appears to have reduced cholesterol by about 10 percent as compared to wheat bran, which lowered cholesterol levels by roughly 4 percent.Oat bran contains soluble fiber, which forms a sticky, gel-like substance in the digestive tract that binds to cholesterol and pushes it out of the body through the stools. Wheat bran on the other hand contains insoluble fiber. Insoluble fiber is good for bowel health and promotes regularity, but it does not remove cholesterol from the body. While the current fad is to promote oatmeal and oat bran as a cholesterol lowering food, there's some doubt about its claims as a magic bullet in the fight against cholesterol. The study cited above from the University of Toronto goes to great pains to point out that the study participants may in fact have lowered their cholesterol levels by swapping out foods rich in saturated fat for plant-based breakfast foods, which do tend to lower cholesterol levels in general. Someone prior to the study who regularly consumed bacon and eggs for breakfast, for example, would undoubtedly show an improvement in blood cholesterol levels when he switches to a bowl of oatmeal regardless of the effect of soluble fiber itself. So whichever food you decide wins the battle of oat bran vs. wheat bran, you'll want to get plenty of bran products in your diet. Cereals are one place to start, as are whole grain rolls, breads, and other foods. You can mix wheat bran into yogurt or other dishes to add some crunch. Breakfast seems to be the easiest meal for most people to ingest bran-rich foods, but no matter what time of day, both oat and wheat bran provide B vitamins, fiber and health benefits.